Lassoed? This sounded rather like a horsey one and the Numpties dwelt under that illusion until almost the end of our solve. When we had worked through clues for a couple of hours we had CAUGHT IN THE ???? of ?OR?? ?S and that did prompt us to wonder about horsey books. It was not to be! Hotspur was carefully leading us astray – as he was about his membership of the Listener tippling squad. ‘Hester and I leave the Dionysian fest. See me propping up the doorway! (ANTA was the solution but I don’t know why) and ‘Drinking song deprived of contralto and acceptable lone voices’ (S[C]OLI[A] less C and A – should that have been ‘Drinking songs’?). There he was singing the song and propping up the doorway but it seemed to stop there. There was a dearth of spirits this week! Clearly these were the areas where those clashes were hiding – but they didn’t leap to the eye. Of course, when all had neatly fitted into place, the solutions led us to the URVA, a crab-eating mongoose, to TSURIS or woes and the AMES test for carcinogens. A little bit of Wiki searching led us to JAMES MURRAY. We should have seen that hours before. 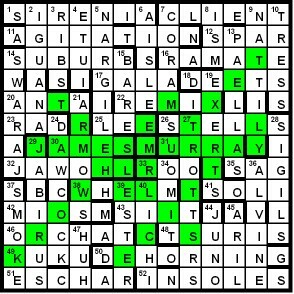 However, we still had to find four words, as we were prompted that there were six in all that had to be highlighted. Our clash pairs were E/B, O/A, S/E, R/V, M/R and I/L. Of course, we solved this back to front, as VERBAL obviously anagrammed from the potentially rejected letters. There was one of those Numpty head-scratching sessions to find four words that would go through those clashes. Hotspur was too experienced to simply spell out the magic solution right down the leading diagonal. We slowly teased out TEXTURE, TRELLIS, MESHWORK and LATTICE and breathed a sigh of relief. Thank you, Hotspur for a solid work out. This entry was posted on 27 September 2013 at 4:00 pm	and is filed under Solving Blogs. Tagged: Lassoed by Hotspur. You can follow any responses to this entry through the RSS 2.0 feed. You can leave a response, or trackback from your own site.